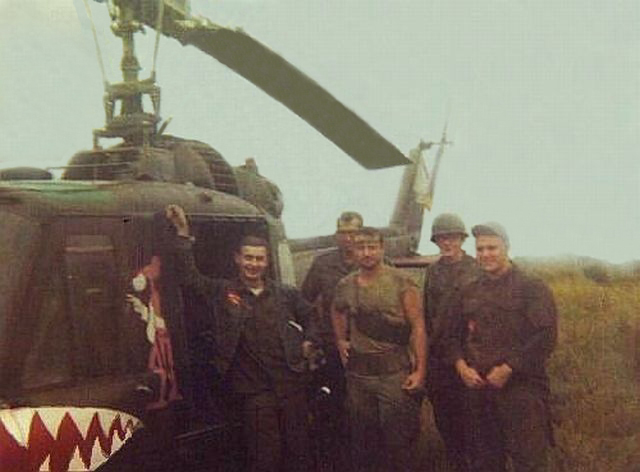 These two pictures of Shark UH-1C 66-00590 and this "motley" crew were taken Christmas morning (December 25, 1969) after Shark 590 experienced an engine failure and "landed hard" out in the boonies. Pictured in the first image below are L-R: Mr. Wayne Clark, the AC (aircraft commander); in back William (Bill) Cowlings, the crewchief; then a Lieutenant (in the "Rambo" outfit with headband) and his radio operator (wearing the conventional helmet), both from the 11th brigade (LIB). 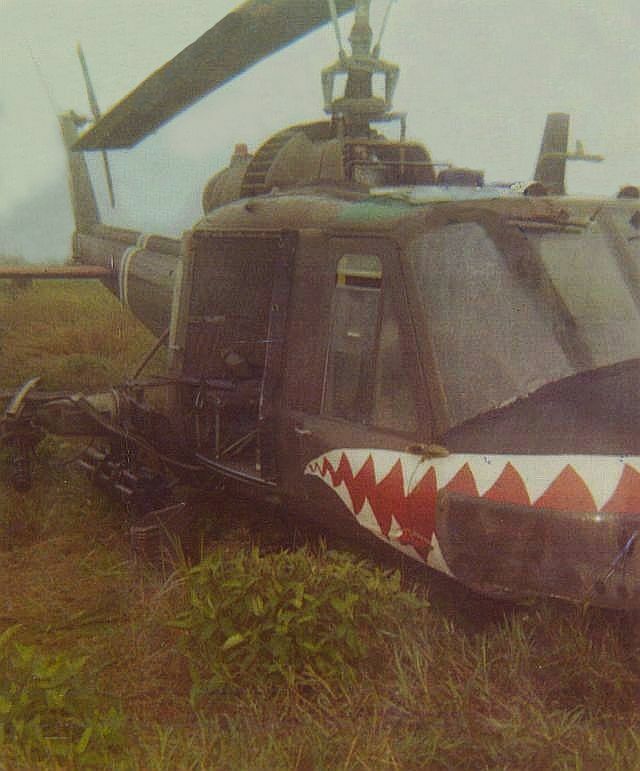 Their names are unknown, but they came charging in with their platoon to secure the aircraft after the engine quit. On the right is Mr. Jim Rich, the Peter Pilot (copilot). Door Gunner Steve Ratcliffe is taking the picture. Steve's personal account of this flight is included below these photos. We were flying around shooting up the countryside when Shark #590 developed a fuel starvation problem. Mr. Clark, with his great flying skills, quickly got us out of the contact area and was looking for a place to put it on the ground. We were about 20 feet off the ground, directly over a two-tier rice paddy, when the engine finally quit! Mr. Clark maneuvered the aircraft to the right in order to land on level ground. We hit the ground pretty hard and bounced a couple of times. Since this was my First and Only Crash during my tour, I was getting my stuff together to be ready to find a good fighting position when we hit the ground. While we were still in the air and Mr.Clark was looking for an LZ, I took my M-60 off the bungee cord and gathered up some extra ammo ready to do my thing when we landed. The only thing I forgot to do was buckle my seatbelt. I was wearing my monkey harness, which I had on a reasonably short length. We hit the ground rather hard, and when we did my M-60 went in one direction and I bounced out of the helicopter in the other. That is until I reached the end of the harness strap, when it jerked me back against the aircraft like a dog on a short leash. We were lucky nobody was shooting at us. We broke a chin bubble during the landing and spread the skids, but that's all. The grunts came in to secure the aircraft. We got picked up and made it back to Duc Pho in time for Christmas Dinner. We didn't want to see Bob Hope that day anyway.